I’ve been baking lots of detailed sweets these days and felt like making something easier for a change. So what did I decide to bake on this slow Sunday morning? 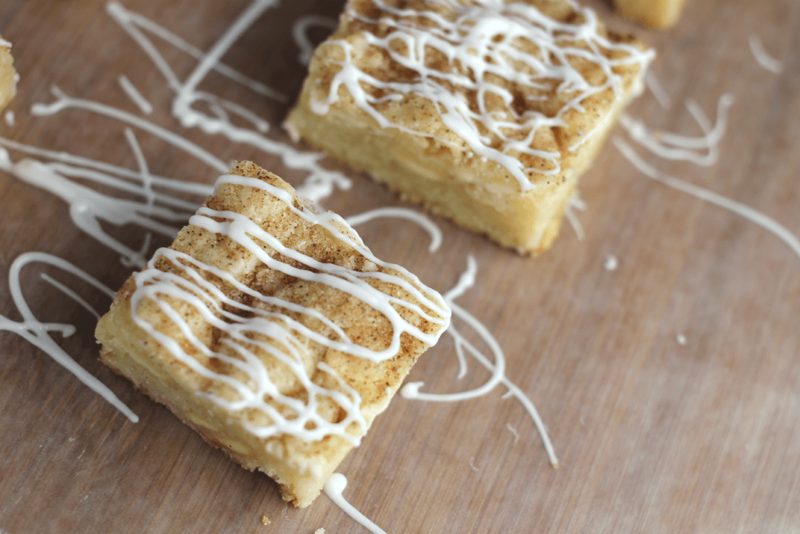 White chocolate chip snickerdoodle bars with a white chocolate drizzle. 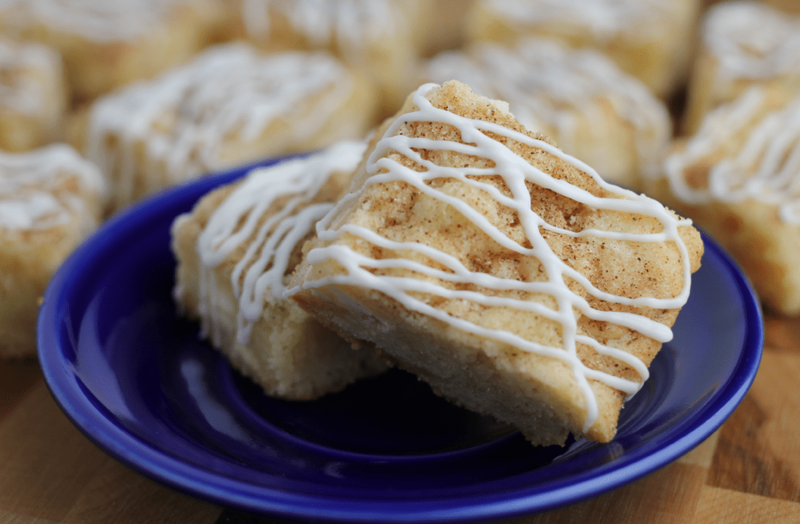 I know, I know… that’s quite a mouthful, which is why I’m also calling them my shortcut Sunday bars. There’s no sifting, no individually dropped cookies, no giant mixer, and no individually placed sprinkles malarkey around here. I’ve made these as drop cookies many times, but this is the first time I’ve made these into bars. Not everyone is a fan of snickerdoodle cookies (Gloria, I’m talking to you), but with the addition of the white chocolate chips these are able to sneak under the snickerdoodle hater radar and get nothing but love. In a medium sized bowl, mix in the flour, baking powder, and salt and set aside. You can actually sift these together if you need to, but I didn’t bother. Side note: does it look like the flour, baking powder and salt are entering some kind of weird vortex in the picture below? Or is it just me? In a separate large bowl, mix the butter and sugar with a hand mixer (or stand mixer with a paddle attachment) until it’s light and fluffy. We’re talking about a couple minutes mixing time here. Two eggs are added to the butter/sugar and mixed in well. Then the flour mixture is added and mixed in well. Once the cookie dough is all mixed up, here come the chocolate chips to join the party. Spread the dough onto a greased or foil lined 9″x13″ baking pan. Sprinkle the cinnamon/sugar mix on top and pop it into the oven for 30-35 minutes, or until the edges are beginning to turn golden brown and an inserted toothpick comes out clean. Mine baked for 35 minutes. 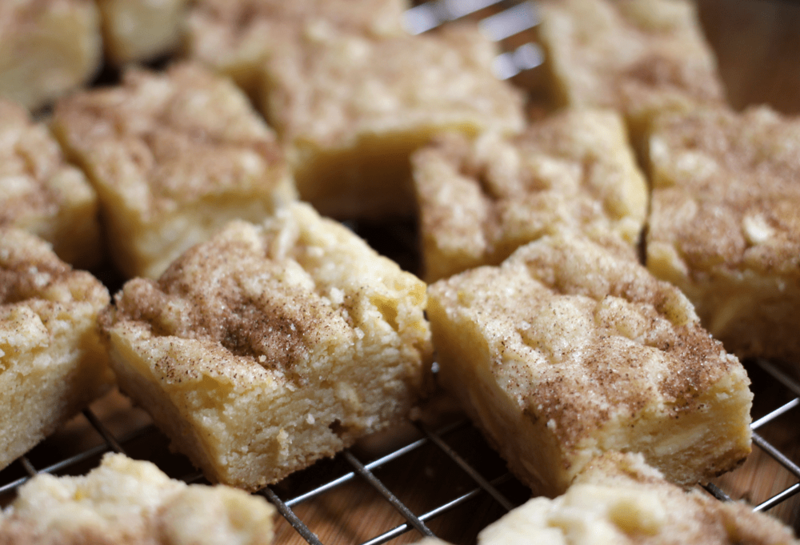 Once baked and cooled completely, just cut them into bars. I cut these fairly small and I got about 40 bars. 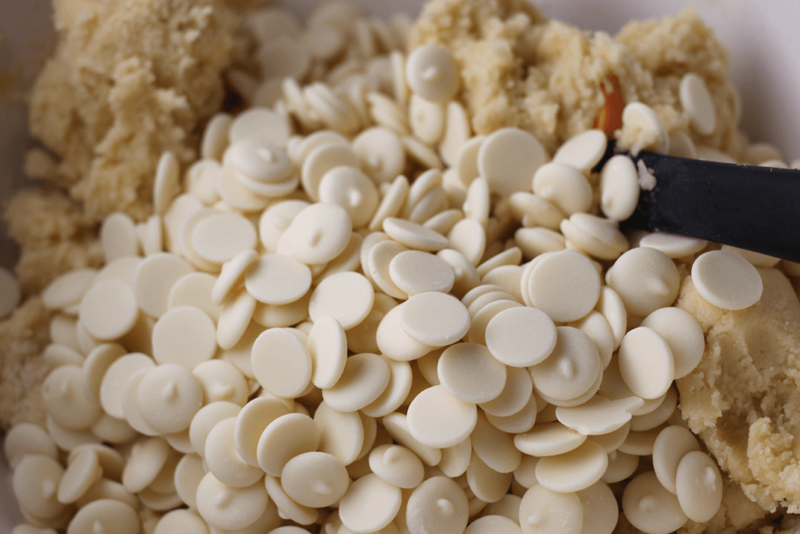 Melt some white chocolate for drizzling. Preheat the oven to 350 degrees. Line a 9″x13″ baking pan with foil. 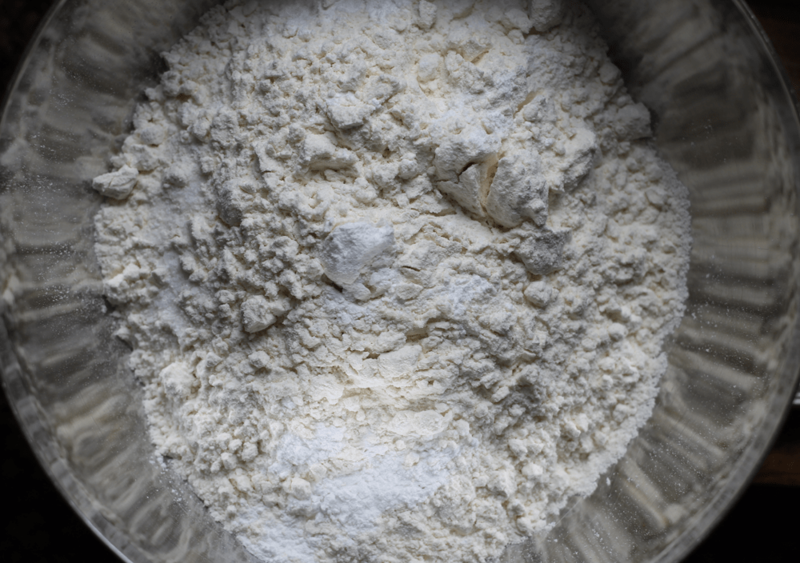 In a medium bowl, mix the flour, baking powder and salt together. In a separate large bowl, mix the butter and 1 1/2 cups of sugar using either a hand mixer or stand mixer with a paddle attachment. 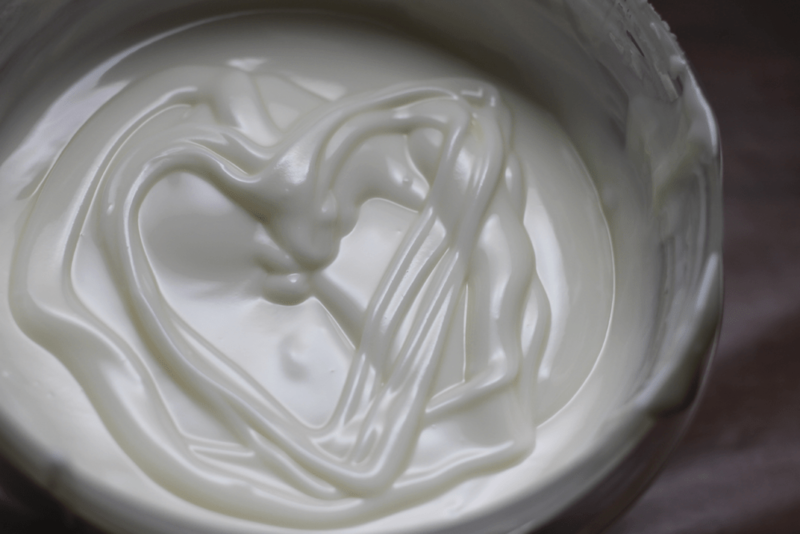 Mix these two ingredients together until they’re light and fluffy, about 3 minutes. Mix in the two eggs and then gradually mix in the flour mixture. 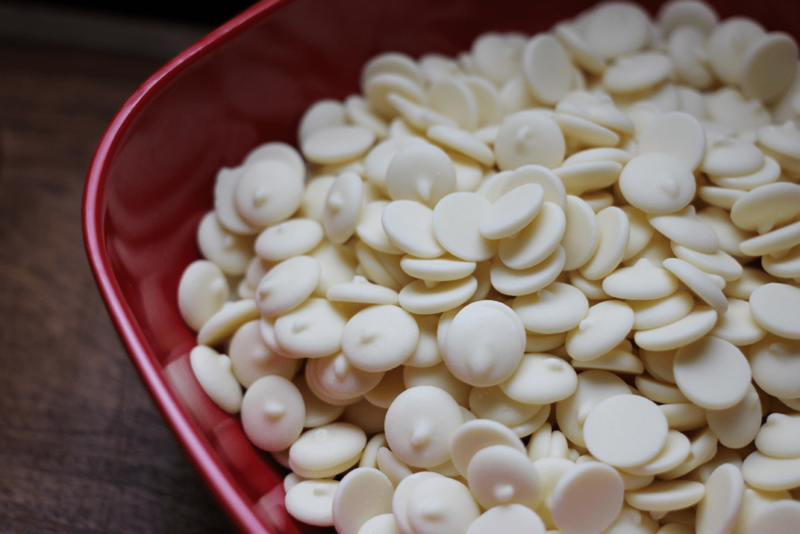 Add in the white chocolate chips and mix until they’re mixed throughout. Spread the cookie dough into the prepped baking pan. In a small bowl, stir the 1 Tbsp and 1 tsp cinnamon together. Sprinkle the cinnamon/sugar over the dough in the pan. Bake for 30-35 minutes. The edges will start to turn golden brown and an inserted toothpick will come out clean. 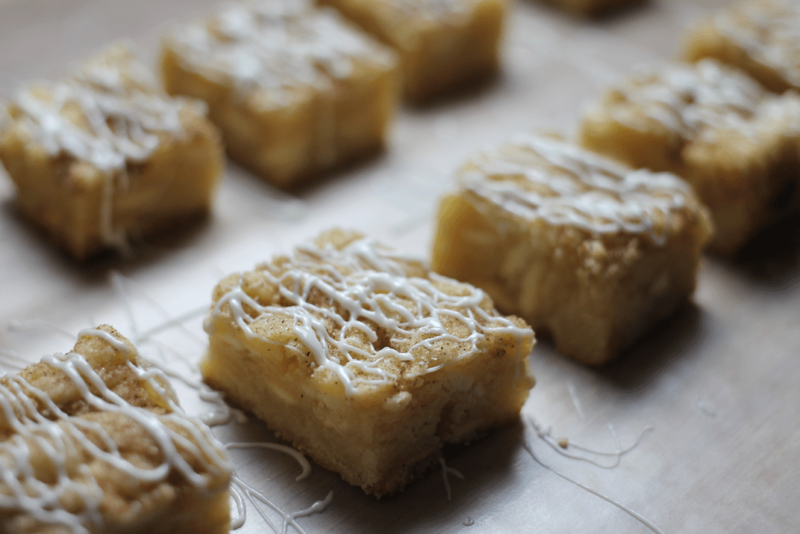 Once baked and cooled, cut into bars. Melt your drizzling chocolate. Place the bars on wax paper and drizzle the chocolate over the cooled bars. Wow! i like the bar ideal they look so yummy.